The Popular Knowledge Women’s Initiative (P’KWI) a farmer organization located in Eastern Uganda has worked with Research for Development teams from the College of Agricultural & Environmental Sciences (CAES), Makerere University since 1996. The CAES developed a strategic plan that among others emphasised linkages of University-based research teams with communities as part of enhancing outreach engagements. As part of implementation of this Strategic Plan, the P’KWI was identified as a partner at the grassroots with whom to work with and increase reach to farmer communities. To this effect, a memorandum of understanding was developed between P’KWI and Makerere University as a sign of formal engagement with commitment to ensure a sustained relationship. Since this formal engagement the CAES has consistently engaged P’KWI and conducted participatory community action research on key commodity crops including among others cowpea, sorghum, cassava, groundnuts, greengram, and sesame. In the process, a vibrant research platform that entails close collaboration between university-based research teams and the community working together as mutual partners has been developed. The partnership has yielded several achievements including among others development and release of varieties, increased uptake of agronomic practices and new technologies. In addition, the research platform has developed farmers’ capacity to effectively participate in the design and implementation of research as equal partners with researchers. The researchers have had opportunity to learn from farmers and have used participatory approaches to design and address farmer research needs. In 2014, the Regional Universities Forum for Capacity Building in Agriculture (RUFORUM) provided a Nurturing Grant to Makerere University to engage with P’KWI through the Cassava Community Action Research Program funded by RUFORUM. Specifically, the nurturing grant aimed to strengthen P’KWI’s internal structures including governance, communication, and engagement with subsidiaries. The P’KWI membership now stands at 4500 farmers and is based on an innovative model that pools together households in a club. This model provides a platform for wider reach to farmers and an appropriate uptake pathway that has among others attracted more partners to work with P’KWI. Currently, P’KWI is working intensely with the National Agricultural Research Organisation (NARO), particularly the National Semi-Arid Resources Research Institute (NaSARRI), Uganda. The focus of the P’KWI – NARO collaboration is participatory breeding of sorghum, seed multiplication and on-farm demonstrations/trials. Other key collaborations include international partners particularly the McKnight Foundation which through a grant (P’KWI 16-273) has capacitated the P’KWI farmer-research network to work closely with Makerere University and NaSARRI on Enhancing cassava and cowpea integrated pest management approaches for food and nutrition security in Eastern Uganda. One of the P’KWI farmers. Mrs. Norah Asiyo serves as the Principal Investigator for this project – http://www.ccrp.org/projects/pkwi. 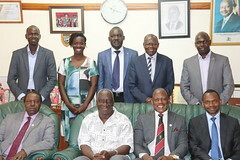 The Makerere University – P’KWI collaboration has provided a platform for both undergraduate and postgraduate students to undertake their research projects and field attachment internships. The P’KWI is engaged in mutual joint activities on research and value addition with non-Governmental Organizations (NGOs) and Industry/private sector. The Women Farmers have had opportunity to share their experiences both at national and international levels. “RU 2014 CARP 04 – Strengthening Capacity of P’KWI to Support University Training and Research Programmes”.